This post was originally published on March 3, 2010. It was substantially revised and reposted on July 27, 2015. 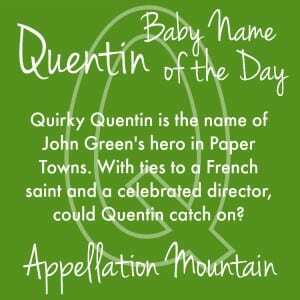 Novelist John Green is a great namer, and today’s choice could be another name boosted by his books. 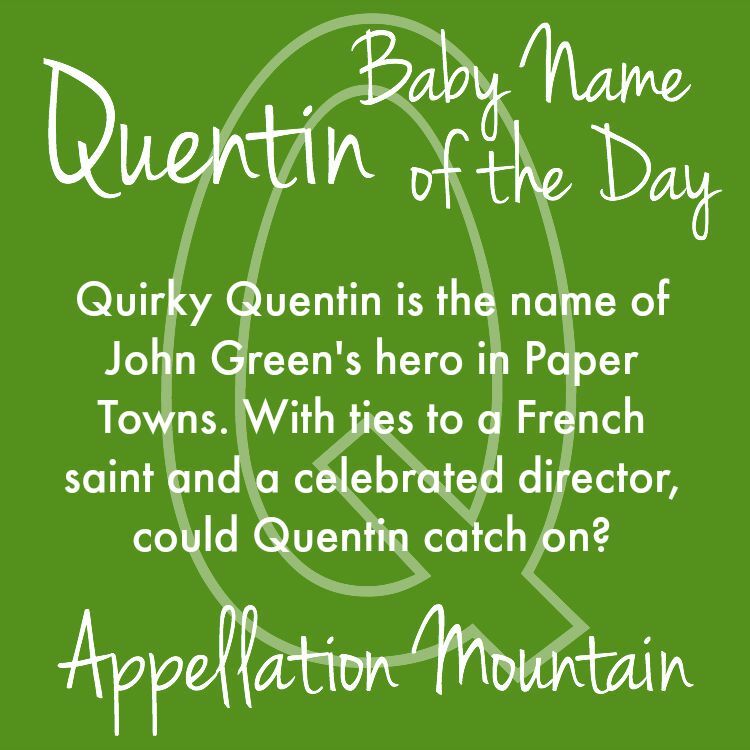 Thanks to Emma for suggesting Quentin as our Baby Name of the Day. The name comes from the Latin quintus – five. Quintus, Quintius, and Quintinus may have started out as names for fifth-born sons in ancient Rome. French form Quentin has been popular over the centuries, including recent years. Credit a third century saint. Quentin was a Roman citizen and Christian convert. After being arrested, he continued to preach the gospel and so annoyed his captors that they chopped off his head and tossed him in a swamp. Fifty-plus years later, his body was recovered and a tomb and cathedral built. 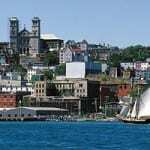 The town became known as Saint-Quentin. 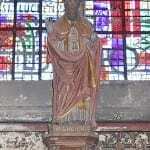 The saint was a major figure in medieval France. Quentin came to England with the Normans, where Quinton – the queen’s manor – was already in use as a place name. Sir Walter Scott gave the name to his hero in 1823 novel Quentin Durward. Durward was a brave Scottish archer who gets the girl he loves. A major battle took place in German-occupied Saint-Quentin. The youngest son of President Theodore Roosevelt was a child when his dad won the White House. During World War I, Quentin became a fighter pilot and died in action. In 1915, the name had been unranked in the US. By 1919, it had reached #220 – a patriotic choice boosted by current events. William Faulkner’s fictional Quentin Compson appeared in The Sound and the Fury, and other stories. He’s a tormented soul. Faulkner’s character inspired Connie Tarantino to give the name to her son. She’d planned to call him Quint, after Burt Reynolds’ character on Gunsmoke, but decided Quint needed a formal name. Because violence is a hallmark of Tarantino’s Oscar-winning movies, the name feels creative and tough. California’s San Quentin prison first opened in 1852. It’s been home to notorious criminalsfrom Black Bart to Charles Manson. Add in a few athletes and fictional characters, and the name has an undeniable ed ge. England’s Denis Pratt became outspoken writer known by his pen name, Quentin Crisp. 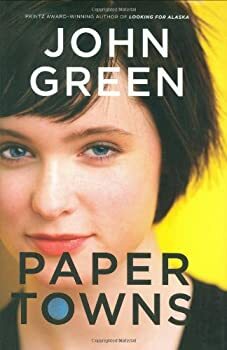 John Green’s novel Paper Towns was published in 2008. The story sends Quentin Jacobsen – called Q – on a quest to find his childhood friend Margo. He and Margo drifted apart, but reunite briefly before high school graduation, and Margo’s disappearance. The Fault in Our Stars, another Green novel, became a hit in 2014. The names of Stars‘ main characters, Hazel and Augustus, also got a lift, with Hazel climbing 50 places and Augustus an impressive 144 spots. Quentin has been trending downwards, ranking #471 in 2014. Quinn is more popular for girls, but falling for both genders. The name ranked #363 in 2014. Quincy came in at #622. Back in 1998, Quentin reached #272. That’s still fairly obscure. 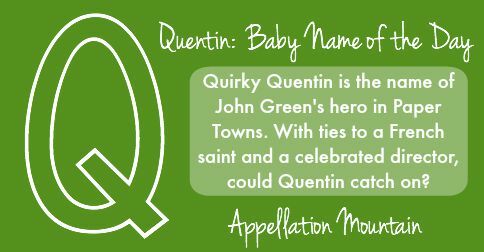 The question is whether Green’s novel is enough to make parents reconsider a fading name, or whether Quentin will remain a literary, creative, and under-the-radar possibility for our sons. Do you think this name will catch on? Would you consider Quentin for a son? I really like Quentin a lot, always have. (I think young Josie had a formative crush on the son on Grace Under Fire…) Also a huge Tarantino fan. Husband detests the name and finds Tarantino creepy, so claims “Quentin is exactly the sort of name a foot fetishist has” and when our cat is creepy and/or rubbing against feet or shoes, calls the cat Quentin. Over his dead body would I get to use it for a kid, unfortunately. Not very fond of Quinn, Quade/Quaid is pretty good though. I do like Corbin & Quillan. I adore Quentin!!! It’s my number one pick for a boy right now. I love that it sounds both tough and poetic/artsy at the same time. I’m not fond of the meaning but I still love it. The nickname Quin and Quent are adorable too. I love Quentin! 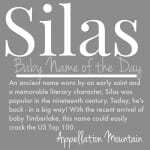 It’s one of my favorite names, even though I think of the prison. It also reminds me of Johnny Cash because he had an album called “At San Quentin”. I am a huge fan of him. One of my cousins named her first-born daughter Quinn, who is now 18. Also, I know two Quentins personally, both men in their 40s, although they don’t know each other. I like this name, but I wouldn’t use it personally. I have too many other favorites! My first association is the illustrator Quentin Blake, which makes me like the name because of his illustrations for the Roald Dahl books. Can’t see using Roald, but Quentin is usable. I’m not a fan. To make it worse, I know a mommy of a Cayden, who had a second son and named him Quintyn. Or was is Quynten? I don’t know, but her reasoning was that since big bro had a Y in his name, little bro ought to as well. This kind of ruined the name for me, even if it hadn’t already been off my list. It’s not bad – it’s just not my style. It’s a family member’s middle name – I don’t think he actually liked it, to be honest. It’s a bit dull to me. I do like Quinn & Finn, though. 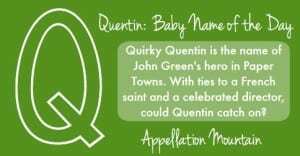 I really like Quentin/Quintin but would feel wrong naming a child something that is essentially a number. It would be akin to naming a first born Secundus – unless it was the fifth child or born the fifth day of the fifth month, or some other very good reason, I just couldn’t do it.